The new Mercedes Benz CLA. This Edition 1 model is not to Irish specification, and will not be offered here. Mercedes-Benz describes the CLA coupe as not only the most emotional vehicle in its class, but one that it is also highly intelligent. The new CLA offers an array of clever solutions, including MBUX interior assist, which recognises operational demands from gestures, and understands indirect voice commands , and ‘energizing coach’ that provides individual fitness recommendations. There are also ingenious details when it comes to the aerodynamics and new functions for the ‘intelligent drive’ assistance package. The design underlines the coupe character with its stretched form and design elements such as the bonnet with power-domes and the rear licence plate which has been moved down. As such it does justice to its predecessor’s status as a design icon in this segment. Ola Källenius, responsible for croup research and Mercedes-Benz cars development, says they are taking car intelligence to the next level with an intelligent interior assistance system for the compact class. "By recognising gestures it facilitates natural operation,” she says. “This is not the only new feature by which the CLA offers a great deal of automotive intelligence." Britta Seeger, responsible for Mercedes-Benz Cars marketing and sales, says the first CLA was a huge success, selling some 750,000 vehicles and created a new segment with a four-door coupé. In Europe, CLA customers are among the youngest in the Mercedes portfolio. In 2017, one in two customers in Europe previously drove a competitor's vehicle. 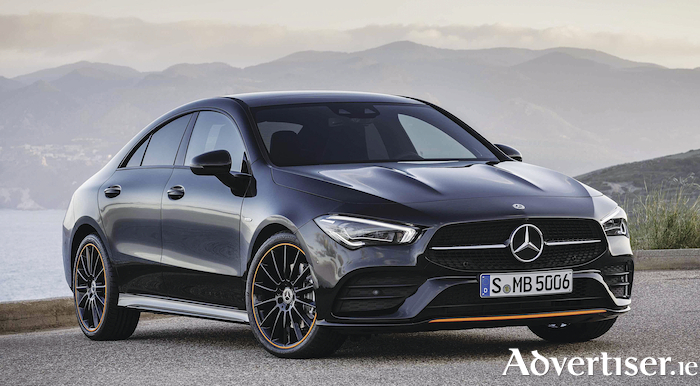 More than 75 per cent of European customers who previously drove a CLA as a coupé or shooting brake, chose a Mercedes Benz again for their next vehicle. In total, some 750,000 units of the first-generation CLA coupé and CLA shooting brake contributed considerably to the compact car's success. The new CLA will be manufactured in Hungary and comes onto the market in early summer. By then there will be a broad range of diesel and petrol engines available, featuring manual or dual-clutch transmissions and 4MATIC all-wheel drive. In Las Vegas last week, the CLA on display at the unveiling was the CLA 250 with the powerful four-cylinder petrol engine (165kW/225hp, 350Nm ) with 7G-DCT dual-clutch transmission. It promises a combined fuel consumption 6.3-6.1 l/100km, combined CO2 emissions 143-140g/km. Please note that the car pictured is not to Irish specification, and the ‘Edition 1’ model will not be offered here.